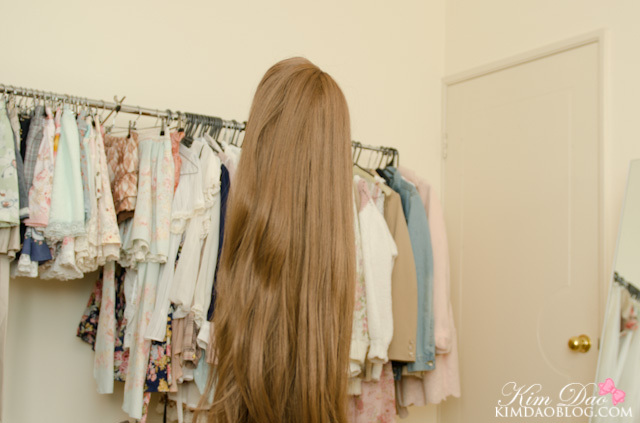 Today I’m going to be reviewing a wig that I have received from Himecastle. They sell heaps of hime and gyaru things that would be perfect for that style including makeup, lenses, wigs etc. So!Himecastle contacted me a while back asking if I was interested to review a product of theirs. I went through their wig section and picked out a wig to review! When I first opened it, I was surprised at how soft the wig was! I’ve owned many wigs in the past for cosplay, and none of them have been this soft before. It is also super easy to brush out and doesn’t tangle much at all. First I had to put on a wig cap. You can make this yourself out of a new pair of stockings or something, or you can get them really cheap on ebay. The wig doesn’t come with one, I got mine a couple of years ago for cosplay. Tie your hair into a bun and put the wig cap on, securing it with some bobbi pins. You can now put on your wig! Overall, I absolutely love this wig! It's a bit longer than what I'd liked it to be, but the quality is great. The softest wig I've ever owned and it is much easier to brush out and doesn't get tangled as easy. I'm always really honest when it comes to my reviews, so when I say that it is good, I really mean it! Check out both their sites if you guys are interested in more gyaru goods!! So nice *-* It's really nice for those day were we wake up an think "hm...today I want to look different" but without losing our normal way. The colour suits you well! It also looks realistic apart from the wig not being able to conform fully to the shape of your head xD I was wondering, does it look really realistic/natural in real life, not in photos? haha yeah that's true! hope you have a great day too! hahah yeah xD it actually does look really real in real life!